Wednesday was a relatively mellow day for U.S. stocks, as many equities consolidated their gains from the prior session. That allowed some high-quality setups to emerge, helping us pluck out a few top stock trades. 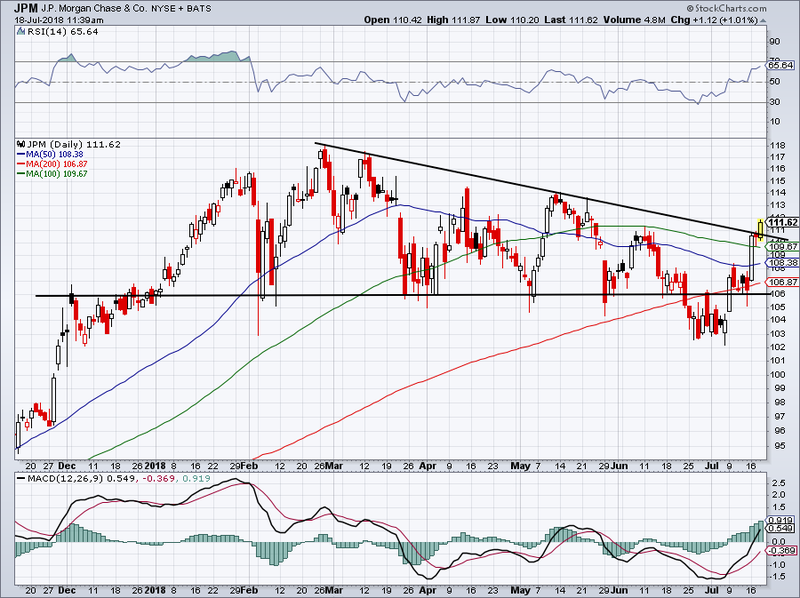 It took a few days, but shares of the JPMorgan Chase (NYSE:JPM) finally pushed through downtrend resistance. We just looked at the bank as one of top long-term stock picks, thanks to its 43% dividend increase and reasonable valuation. As for the charts, we’ll opt to keep it simple, stupid — KISS. Over downtrend resistance and bulls can stay long. Below and short-term investors can exit with minimal losses. Below $106 is worrisome. We flagged Overstock (NASDAQ:OSTK) at the end of last week, telling investors to watch for a potential breakout over $40. Well, OSTK didn’t just close over $40, it blew through the mark, even rallying past $43 in a single session. For those that missed the breakout though, Overstock is providing a second chance. Pulling back some 4% on Wednesday, investors can buy OSTK with a solid-risk/reward. Now near the $40 level and the 100-day moving average, there should be decent support just below current levels. Conservative investors can exit their position on a close below $40. Should it hold as support though, look for a possible run up to the $45 to $48 range. 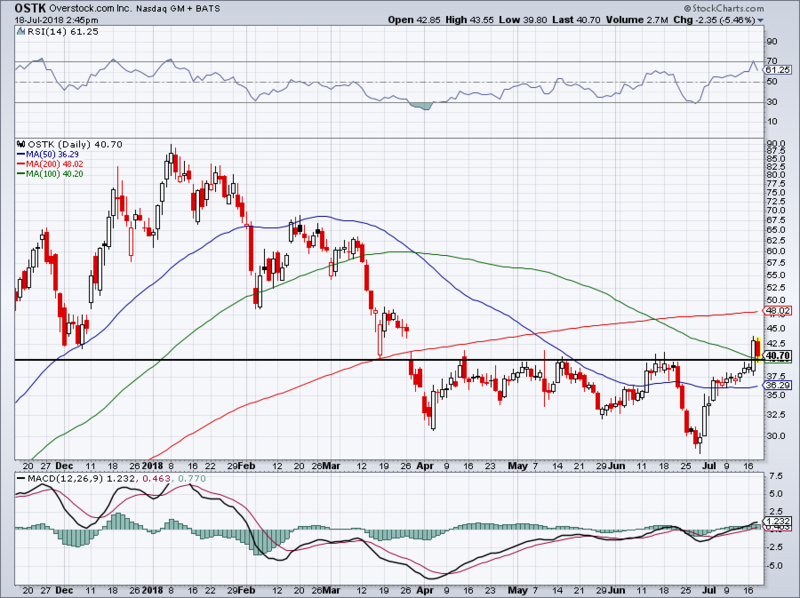 Keep an eye on this $68 to $70 level for Square (NYSE:SQ). Shares have been in a healthy uptrend and failed at this level before. 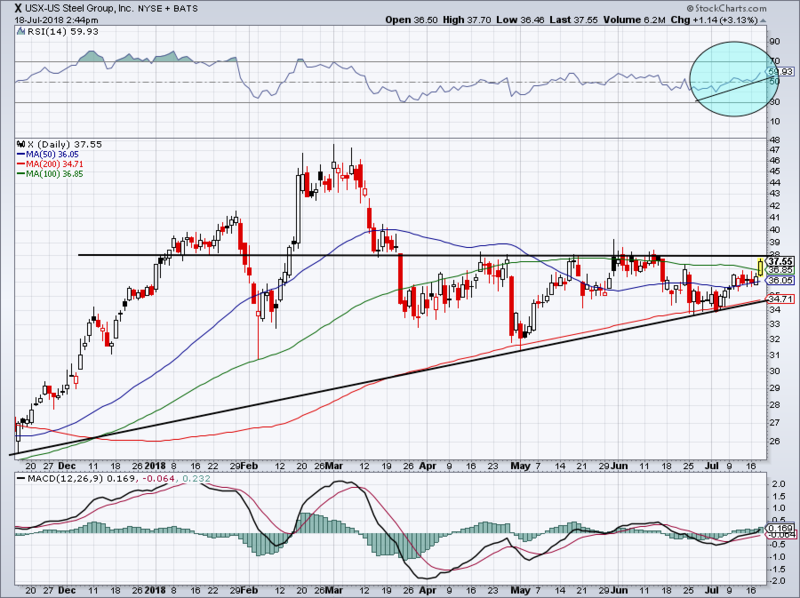 If SQ can push through and rally, the area could turn from resistance to support. The MACD says bulls have momentum and the RSI shows that it’s not yet overbought (blue circles). I am looking to buy a breakout over resistance or pullback into support. Another stock to keep an eye on? U.S. Steel (NYSE:X). Shares are ran 3.5% Wednesday and got right near $38 resistance. The stock has held both trend-line support and its 200-day moving average on the downside. So what should investors do now? $38 has kept a lid on X, but the more times a level is tested, the more apt is to eventually break. Should X close over $38, then investors can justify a long position. 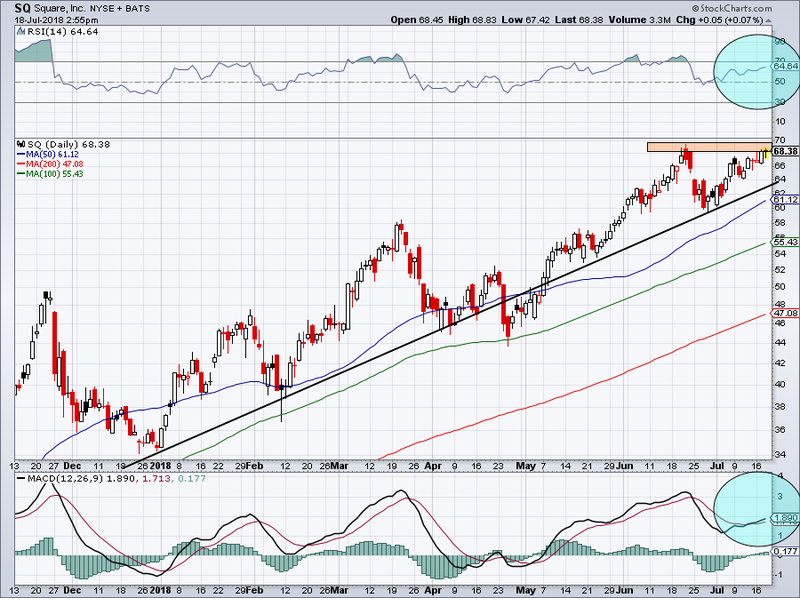 Otherwise, it may be best to buy on a pullback into the mid-$30s. Either way, X — with its low valuation — is one to keep an eye on. 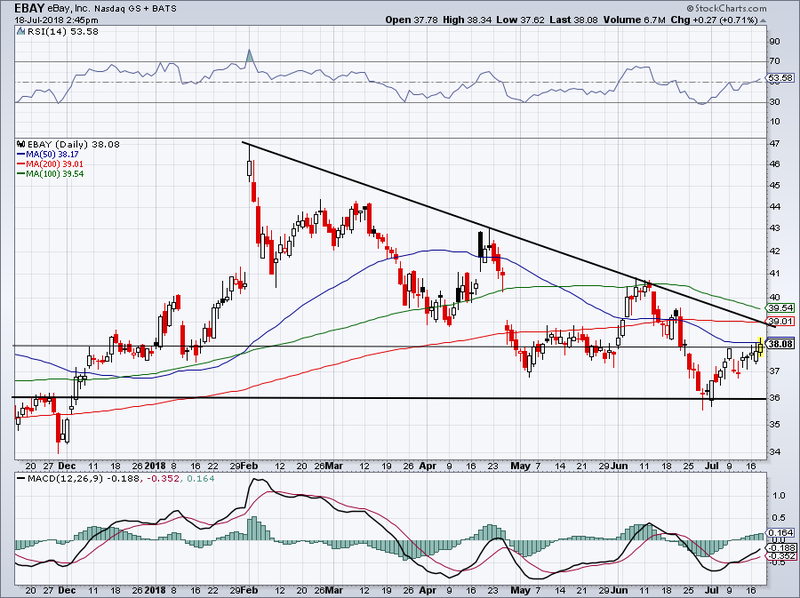 There are a lot of stocks setting up for potential breakouts or that just broke out. In fact, this whole list contains these such names. One that doesn’t interest me much though is eBay (NASDAQ:EBAY). Shares of the online auction site have been doing well lately, rallying from about $35.50 to just over $38 currently. Although it was good to see $36 hold as support, shares have less than $1 to go before hitting some major potential resistance. EBAY is struggling with its 50-day moving average at the moment, while its 200-day and 100-day moving average sit just above at $39 and $39.50, respectively. Further, there’s a stiff downtrend line overhead too, currently just below $39. All of this is to say that, should eBay get above its 50-day, there should be plenty of resistance near $39. I don’t want to buy into that potential resistance. In May, we found other stocks we’d rather buy and that remains true today. Conversely, if EBAY can push through it all, say up to $40, and then find these levels as support, then it looks much more attractive on the long side. Bret Kenwell is the manager and author of Future Blue Chips and is on Twitter @BretKenwell. As of this writing, Bret Kenwell was long OSTK and X. Article printed from InvestorPlace Media, https://investorplace.com/2018/07/5-top-stock-trades-for-thursday-jpm-ostk-x-ebay-sq/.